Richard Croucher, supported by Project Managers Graham Drew and Dennis Howells, draws the winning ticket against the backdrop of King Class locomotive 6023 currently under restoration in Didcot’s Locomotive Works. 31574 – J E Loder, Didcot, Oxon. 22826 – L Timlett, Sandhurst, Berks. We are now beginning to work towards the final phase of the power bogie construction and it is our intention to continue to fund raise over the coming year in order to try and achieve completion during 2009. As things currently stand there appears to be about another £60,000 required to complete this side of the Project although we must continue to be alert for the unforeseen happening and we are continuing to look for supporters to help us achieve that. The frames of No. 93 in the yard at Llangollen showing the bow now that the weight of the body has been removed. The body of No 93 placed on stands to allow access. At Llangollen the body and frames of Railmotor no. 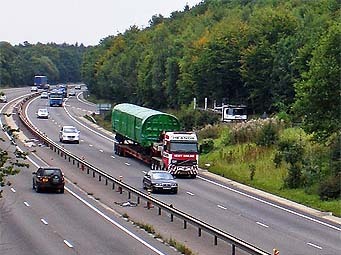 93 have been separated to enable work to proceed separately on each part. The underframe will now have the bogies removed and be shotblasted before the necessary mechanical work takes place. 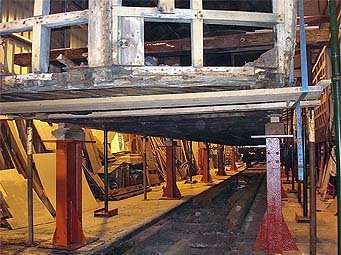 The body has been placed on stands to allow access to the bottom rails so that restoration can begin in earnest. "attempts to bump start the machine are declared a failure ?!" 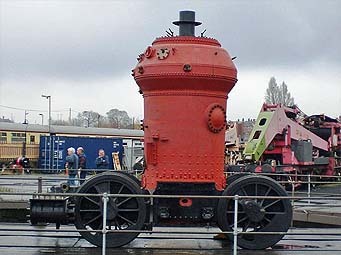 On Tuesday the 27th there was a sight at Tyseley Locomotive Works that had not been seen since 1935 - a Railmotor boiler sitting in the frames of a power bogie. Work is also progressing behind the scenes on the procurement of forgings to complete the power bogie motion, and construction of the bogie sand boxes. Plans are in hand to move the bogie and boiler to Didcot for display in the new year, this being the only opportunity to view the assembly in detail before it is fitted to the coach. At the beginning of November, No 93 was shunted into the carriage shed at Llangollen for work to be undertaken prior to lifting the body from the underframe. Work is also progressing behind the scenes on all the items required for the coach restoration, with the manufacture and machining of castings such as brake columns and door handles. We are planning to have a public open day at Llangollen in April to coincide with their Gala event to view progress on the coach body and underframe - watch this space for details! In order that the rail motor can remain mobile when the power bogie is not installed an “accommodation” bogie has to be fitted to the coach. 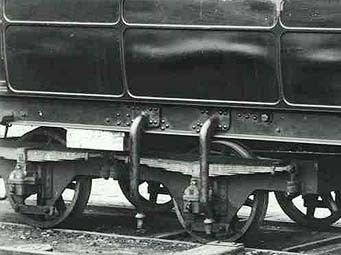 The GWR adapted old wagon bogies for this application, and one can be seen in the photograph taken at Swindon of Rail motor number 70 when undergoing maintenance. Our Project has followed the same policy, and has purchased a redundant bogie that is to be adapted to fit under the rail motor. This bogie which is from an ex B.R. freight vehicle has now been delivered to Llangollen and will be modified to fit under Number 93. 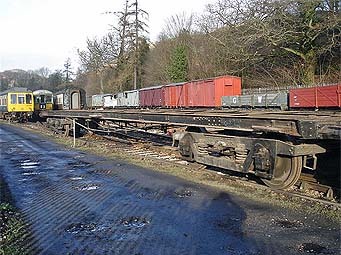 We have opted to use a modern bogie in this application, rather that cut up the existing bogie, which was placed under 93 when it was converted to an autotrailer in 1935, and is a serviceable GWR item which is an historic artifact in its own right. 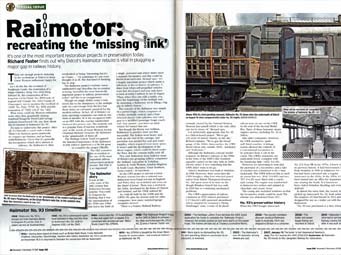 Steam Railway Magazine's Deputy Editor, Richard Foster, includes a major feature article on the Steam Railmotor project in the special issue devoted to the GWR. Issue No 342 also contains a feature on 'Pendennis Castle' and, as might be expected, much else of interest to the Great Western enthusiast. Quite a lot of work has been undertaken in the last few months preparing the chassis to receive the boiler and it is hoped to unite the two in the next month or so prior to the move to Didcot. Work is nearing completion on the piston rods and these will be fitted to the two crossheads and then assembled on the bogie. Work is also getting under way on the sand boxes with seven small patterns needed for items which need to be cast prior to assembly within the individual sand boxes now being made. Another item being cast at the moment is the main steam pipe (inverted Y) to the cylinders; the pattern cost an arm and a leg but the casting is relatively cheap. Work is also now getting under way on machining the two connecting rods which will follow the piston rods. The Society is hopeful that we can finish the power bogie before the coach is ready to receive it and as you can see work is going forward on a number of fronts simultaneously. 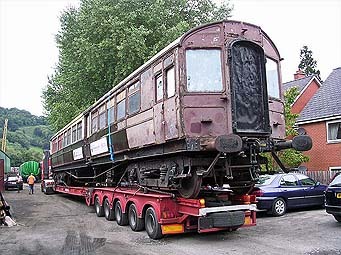 On Thursday 6th September the vehicles were loaded onto road transport in Milton Freight Terminal and dispatched to the Llangollen Railway for restoration. Railmotor No. 93 left Milton by lunchtime on Thursday arriving at Llangollen early the same evening, and was been unloaded the following morning. Trailer No. 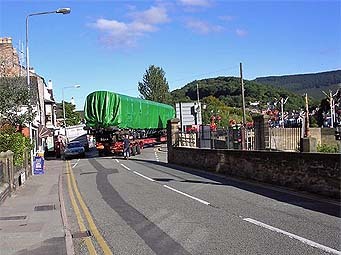 92 was loaded at Milton by late Thursday afternoon, and spent the night in Andrew Goodman's yard, being delivered and unloaded at Llangollen late on Friday morning. 04 September 07 - Railmotor and trailer make their first mainline run! 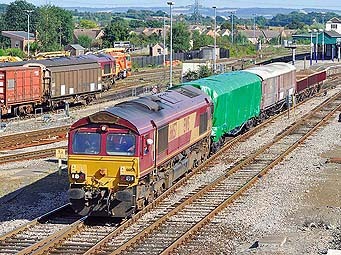 On Tuesday 4th September an EWS class 66 locomotive collected the Railmotor and Trailer (Nos. 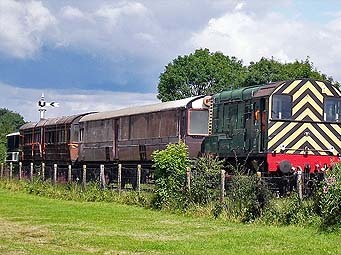 93 and 92) from Didcot Railway Centre and tripped them the short journey to Milton Freight Terminal. This is the nearest point at which they can be transferred to road transport for their onward journey to the Llangollen Railway for restoration. The walkover seats will be collected from storage and loaded into trailer 92. The vehicles are then scheduled to be moved by road to Llangollen, through the good offices of Andrew Goodman's haulage company, departing on Thursday 6th September and arriving on Friday 7th. The Railmotor body has been tastefully wrapped in green tarpaulin to offer protection to the vehicle and to prevent any hazard from bits of bodywork which might not be as well attached as we might hope! 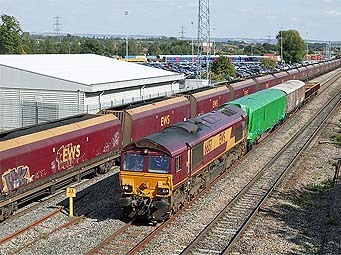 In order for the vehicles to be transported to Llangollen for restoration they must necessarily first traverse the Network Rail lines to Milton Freight Terminal before being transferred to road transport. Needless to say this has involved several inspections, ultrasonic testing of the axles, a pad exam, checking the tyre profiles, several minor repairs to the running gear and a requirement that Number 93 be sheeted 'to avoid any bits falling off'. The culmination of this work was on Thursday 16th August when the Society's Vehicle Acceptance Body (VAB) was on site to check that all was in order. In order for the tests to be carried out the vehicles were run for a distance of more than five miles on the Main Demonstration Line, and we are pleased to report that all went well. The vehicles have been entered on the Rolling Stock Library data base, being allocated TOPS numbers 99092 and 99093, and are now cleared for their journey. Currently both vehicles are prominently displayed next to the locomotive shed where visitors have their last opportunity to view them in the 'before' condition, until they are dispatched to North Wales. The Heritage Lottery Fund has awarded £768,500 to the Steam Railmotor and Trailer Project for the restoration of the original timber bodies and steel underframes of both Steam Railmotor No. 93 and Trailer No. 92. 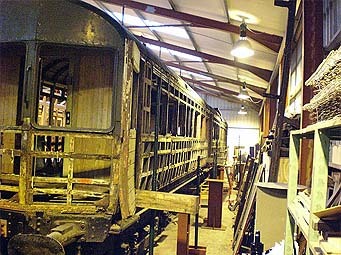 The Heritage Lottery Fund is unable to provide financial support for the construction of replicas, the grant will be applied purely to the restoration and conservation of the original timber bodies of the two vehicles, as well as the refurbishment of the surviving underframes – including return of the steam railmotor’s underframe to the original design to accept the power bogie. The railmotor and trailer vehicles are now being prepared for a move from Didcot to Llangollen, where the extensive and skilled task of restoring the coach bodies will be undertaken in partnership with the award-winning carriage workshops of the Llangollen Railway. It is anticipated that the contract will enable an apprenticeship to be offered at Llangollen, helping to keep coachbuilding skills alive. The first livery to be carried by the restored railmotor and trailer will be lined crimson lake as used between 1912 and 1922, with other authentic GWR liveries to be applied thereafter. Sheena Vick, Heritage Lottery Fund Manager for the South East, said: “The age of steam is one of this country’s greatest gifts to the world. These vehicles stand today as a visible reminder of our proud industrial past and as the link to modern travel. We are proud to help restore them to their former glory for a whole new generation to enjoy. The Heritage Lottery Fund grant has dramatically brought forward the day when the railmotor and trailer will be fully restored. When the work is complete the two vehicles will operate initially at Didcot Railway Centre, taking their place at the starting point in the evolutionary line-up that culminated in the diesel railcar. Additionally it is planned that the railmotor and trailer pairing will travel to preserved heritage railways around the UK to bring this unique travel experience from the Edwardian era back to life for as many people as possible. The Railmotor boiler was steamed for the first time on Thursday 11th. 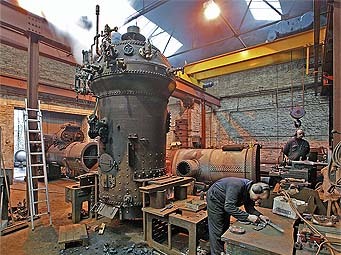 January 2007 at the works of boiler manufacturer Israel Newton of Bradford. The fire was lit and the boiler warmed through during the afternoon of the previous day, and steam was raised to the full operating pressure of 165 psi during the morning of the 11th. This was followed in the afternoon by a detailed inspection of the boiler by Dennis Howells, the Society’s Project Engineer assisted by Richard Croucher and Graham Drew, members of the Project Team. Also in attendance were Adrian Knowles, the project’s publicity officer, and Andy Hook, a member of the publicity team to record the event. The opportunity was taken to check with live steam the various boiler fittings that had been installed previously, and to test the safety valves by “force steaming” the boiler against fully open valves to ensure that steam pressure did not rise above the authorised design working pressure. 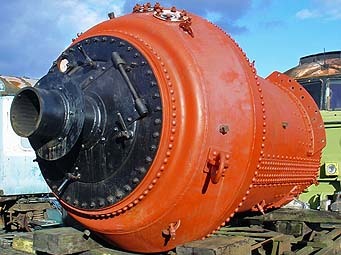 Having successfully test steamed, the boiler assembly has been drained down, dried and preserved to ensure that there is no danger of corrosion to the tubes or boiler shell between now and when the power bogie motion is complete, the boiler fitted and the complete assembly tested. 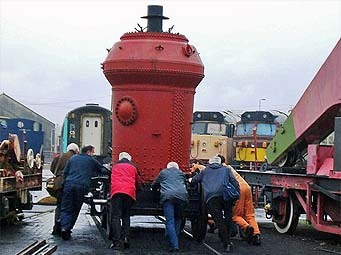 Following the steam test the boiler has been moved from Israel Newton to Tyseley Locomotive Works, where it will be trial fitted to the bogie.